On Sunday, September 23, TeraThink participated in the 2018 Walk to End Alzheimer’s for the second annual year. This walk is the largest event to raise awareness and donations for Alzheimer’s disease. The day might have been gloomy and rainy, but 600 plus people showed up anyway; strong and ready for the afternoon walk! In preparation for this years walk, TeraThink raised money at its’ quarterly All-Hands event. This year, we went to Lucky Strike Entertainment for some good ‘ol fashioned bowling! Everyone who wished to participate donated to the Walk to End Alzheimer’s and highest score of the night took home a gift card. Win-win, if you ask me. On top of that, TeraThink leaders generously matched the bowling donations! 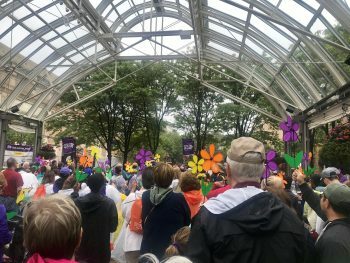 On Sunday, September 24, TeraThink employees, families, and friends participated in the 2017 Walk to End Alzheimer’s. 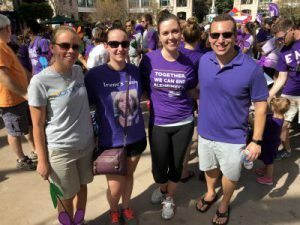 This walk is the largest event to raise awareness and donations for Alzheimer’s disease. Despite the hot temperatures, over 1,000 people showed up strong and ready for the afternoon walk.